Distinctive rich bitter flavour, with its dark, malty brew, balanced by a generous helping of hops. 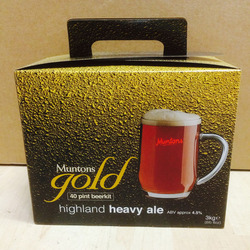 Muntons Gold kits combine premium brewing malt and the choicest hops to allow you to brew the very finest traditional beers. No sugar to add! Truly classic beer, with its full body, rich black colour and distinctive dry bitterness. Muntons Gold kits combine premium brewing malt and the choicest hops to allow you to brew the very finest traditional beers. No sugar to add! Lightly hopped malty English Bitter. Continental Pilsner embodies the full character of European lager style beers. Muntons Gold kits combine premium brewing malt and the choicest hops to allow you to brew the very finest traditional beers. No sugar to add!